Symmetrical or asymmetrical light design?06 Symmetrical or asymmetrical light design? Submit suggestions now!08 What else are you interested in? In conjuction with our subsidiary GL Optic Lichtmesstechnik, we have developed a process to reproduce exactly the light in a JUST standardized viewing booth that is measured before at any place. Find out how it works! Measuring instruments are only one part of comparing and quality controlling colours and substrates. Since no technical device is as precise as the human eye, the visual colour control is still essentail for accurate quality control. Time- and cost-efficient workflow solutions are increasingly being implemented in response to the constantly growing demands as regards delivery capability and pressure of time. Compared to a classical proof printed on production paper, or a digital hard copy proof, a digital soft proof on a monitor permits more cost-efficient reproduction of the original for subsequent production printing. So, while the original to be matched can exist in physical form, it does not necessarily have to. Under optimum circumstances, the original is actually the colour appearance described by the file. Of decisive importance in this context is colour-accurate display on a calibrated monitor, and the use of ICC profiles. The latter can be used for colourimetric characterization of the image data, subsequently permitting their colour-accurate reproduction on the press. The requirements for colour soft proofing systems are described in the latest version of ISO 14861:2015. The quality requirements for colour monitors suitable for soft proofing are defined in ISO 12646:2015. 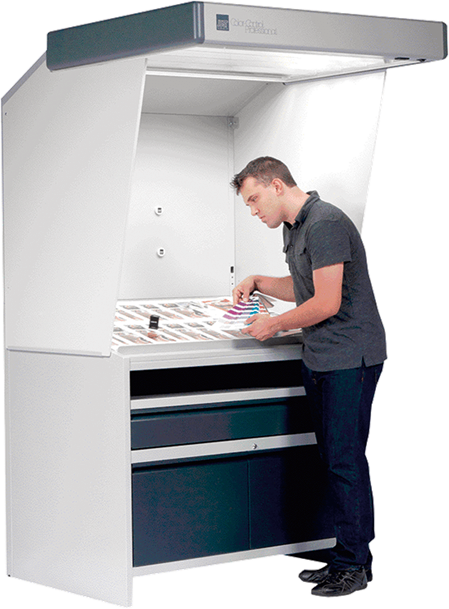 A colour matching booth with standardised light is prescribed as obligatory for colour-accurate visual comparison. The light conditions of the standardised viewing device basically comply with ISO 3664, but it must be possible to adapt the brightness to the limited luminance of the monitor. Our soft proof colour matching booths with USB interface feature software-controlled, exact adaptation to the brightness of the monitor. A high and stable quality of the soft proofs necessitates trouble-free interplay of the individual components within defined tolerances. 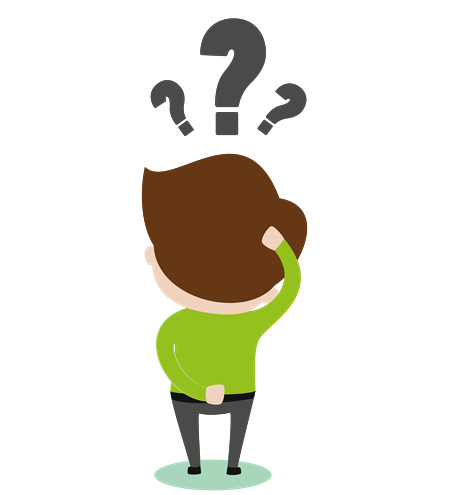 Ask us for more detailed information on the subject of soft proofing. Materials and surfaces can be made fluorescent by admixing optical brightening agents (OBAs). Optical brightening agents are fluorescent substances that absorb light in the UV wavelength range from 300 to 390 nm, and emit it in the adjacent spectral range from 400 to 460 nm. 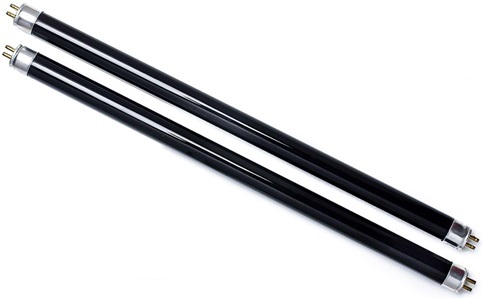 Materials containing added OBAs appear whiter or brighter and more luminous. They are used in some papers, textiles, detergents and plastics. 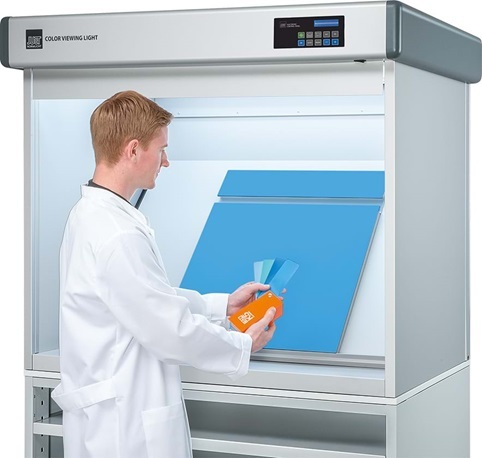 A UV light source is needed to observe fluorescent surfaces. Depending on version, both our Color Viewing Light viewing booths and our multiLight colour proof lights are equipped with UV lamps, in addition to the standard illuminants. The simultaneous activation of D50 or D65 and UV permits reliable assessment of optically brightened materials. The visual impression is determined by the amount of OBAs used and the UV component emitted by the light source. Viewing jobs using UV light are frequently encountered in the textiles sector or in security printing. However, OBAs are nowadays also used in a wide variety of other materials, such as imitation leather, paints or films, meaning that their testing is also acquiring ever-greater importance. The colour system devised by Albert Henry Munsell (1858–1918) was intended to represent colour samples in a manner corresponding to human perception for the first time. In other words: the visual distances between adjacent colour samples were supposed to be perceived as being equal. This gave rise to a three-dimensional body with a vertical value axis (black-white). Principal and intermediate hues are concentrically arranged about this axis in such a way that their chroma decreases towards the value axis. Derived from this, the "Munsell Book of Colour" contains colour charts that can be used for selecting and comparing colour samples. The ambient conditions have a major influence on colour assessment when matching coloured surfaces. That is why the viewing space of all standardised viewing devices from JUST is normally powder-coated in the reference colour Munsell N7, which corresponds to a neutral, matt gray. Compared to other Munsell colours, Munsell N7 displays the least metamerism and the slightest colour shifts when viewing under different illuminants. The JUST Color Viewing Light viewing booths are also optionally available in the neutral gray shades Munsell N5 and G5574. Symmetrical or asymmetrical light design? JUST colour proof lights fundamentally offer a choice between a symmetrical or an asymmetrical light design. 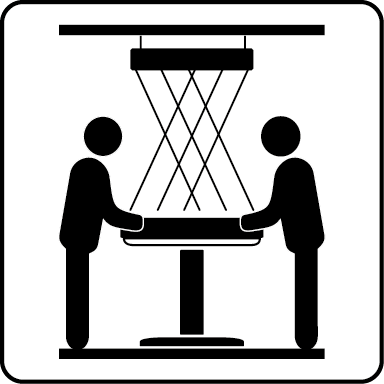 In a modern, symmetrical light, the rays of light are directed onto the viewing surface in diagonal, cross-over fashion ("cross-symmetrical"). As a result, the observer's position is of no importance. He sees the same thing from all sides. In contrast to conventional, symmetrical systems, which guide the light directly onto the viewing surface in all directions, glare and reflections are almost entirely avoided. This solution is generally used in conference rooms. The latest generation of asymmetrical systems offers even better characteristics as regards glare and reflections. So, if possible, preference should be given to a colour proof light with asymmetrical light design, since the rays of light are then not deflected towards the observer. In this case, viewing is performed from one side. 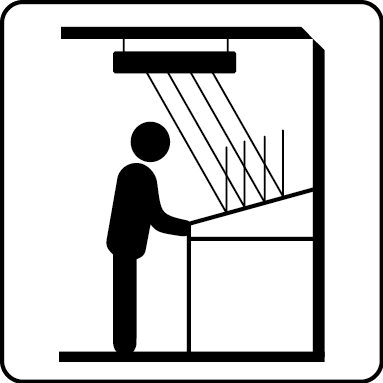 Consequently, all viewing stations from JUST Normlicht are equipped with an asymmetrical light, since viewing is only performed from one side on these devices. How do you identify the light design of a colour proof light? Products with the letters "AS" are asymmetrical lights (for viewing from one side), while those with the letters "CS" are symmetrical lights (for viewing from several sides). 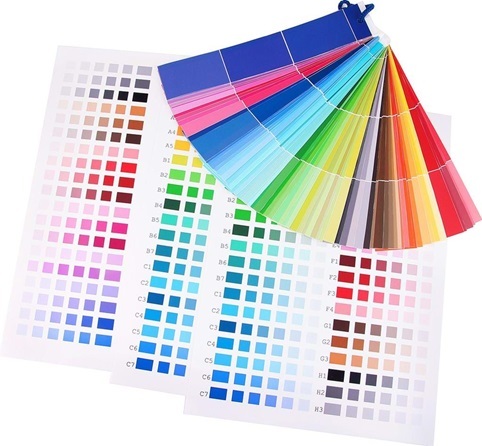 The valid ISO 3664:2009 standard regulates the viewing conditions for the colour proofing of originals and reproductions in the graphic arts industry. The users are photographers, advertising agencies, classical prepress businesses, and printers on the press. The ISO standard essentially defines the requirements for the viewing conditions, test methods, and both obligatory and recommended targets to be achieved. What would you like to find out more?